Non-enveloped, rod shaped about 85-390 nm in length and 20 nm in diameter. The right-handed helix with a pitch of 2.6 nm has an axial repeat of four turns, involving 49 capsid subunits. Each capsid protein covers four nucleotides on the genomic RNA. Segmented, linear, ssRNA(+) genome. The four to five segments are 1.3 to 6.7 kb in size. The genomic RNA are capped, and polyadenylated. Genomic RNAs serve as messenger RNA. 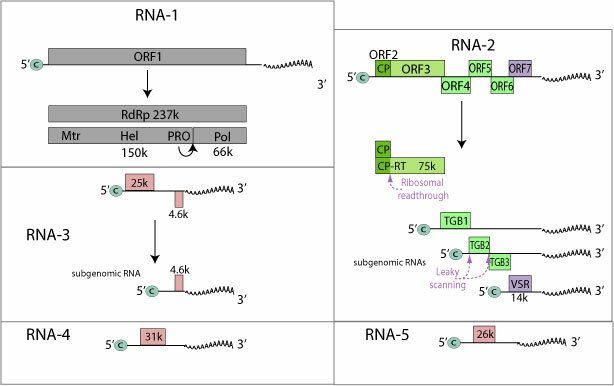 Subgenomic RNAs are synthesized during replication for segments 2 and 3. Suppression of termination on segment 2 produces the 75k protein. Leaky scanning allows expression of the movement proteins TGB2 and TGB3. Expression of the subgenomic RNAs (sgRNAs). Virus assembly, each segment is encapsidated. Viral TGB movement proteins probably mediate virion cell-to-cell transfer. GEOGRAPHY Europe, Asia and North America. The cysteine-rich protein of beet necrotic yellow vein virus and tobacco rattle virus act as suppressor of RNA silencing in roots, but not in leaves .